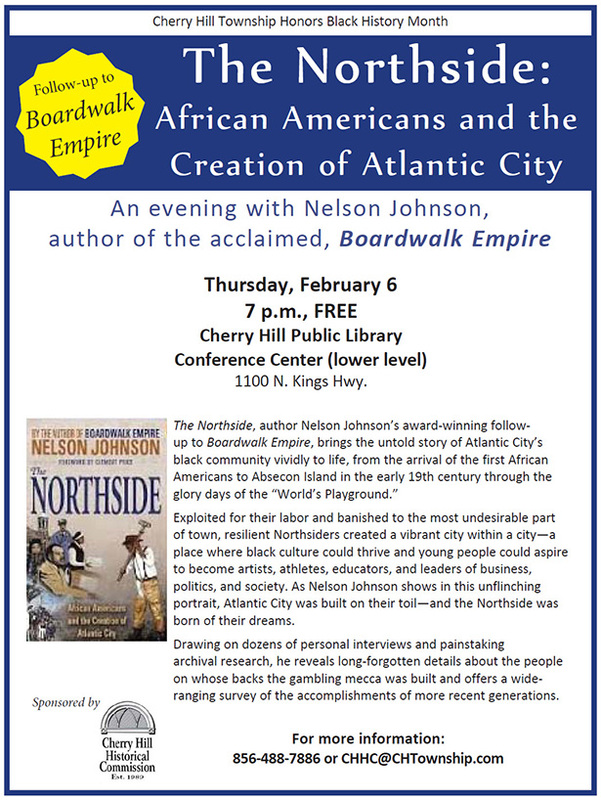 *Tonight* Boardwalk Empire author Judge Nelson Johnson returns to Cherry Hill for Black History Month. A representative from Plexus Publishing will be at the event to introduce Judge Johnson and give a brief account of how Judge Johnson initially went to Plexus with his manuscript and how HBO picked it up as a series. He will also discuss how Boardwalk Empire inspired Judge Johnson to write The Northside. Copies of both books with be available for sale/signing following the program. All sale proceeds are being donated to the United Way of Atlantic City and The Boys and Girls Club of Atlantic City. An evening with Nelson Johnson, author of the acclaimed, "Boardwalk Empire"
"The Northside," author Nelson Johnson's award-winning follow-up to "Boardwalk Empire," brings the untold story of Atlantic City's black community vividly to life, from the arrival of the first African Americans to Absecon Island in the early 19th century through the glory days of the "World's Playground." Exploited for their labor and banished to the most undesirable part of town, resilient Northsiders created a vibrant city within a city - a place where black culture could thrive and young people could aspire to become artists, athletes, educators, and leaders of business, politics, and society. As Nelson Johnson shows in this unflinching portrait, Atlantic City was built on their toil - and the Northside was born of their dreams. Drawing on dozens of personal interviews and painstaking archival research, he reveals long-forgotten details about the people on whose backs the gambling mecca was built and offers a wide-ranging survey of the accomplishments of more recent generations.